Like everything else in his life, Elvis’ love for horses was over the top. There are stories of him going to breeding farms before dawn and asking to buy their horses. Many of his own mounts were barn sour, meaning they developed a habit of trying to turn around on the trail and run home, because Elvis always galloped his horses home at full speed. But he was also a doting owner. Although Elvis rode his horses hard on the trail, he made sure they were cooled down before putting them up for the day. He would go on shopping trips for new horses so often that he bought a 163-acre ranch in Mississippi, which he named the Circle G, to keep the horses. Many of his purchases were gifts for friends and family so they could ride alongside him. The first horse he bought, Domino, was a Christmas gift in 1966 for his wife, Priscilla. One of the King’s favorite horses was a palomino Quarter Horse gelding with the unflattering name Midget’s Vandy, which Elvis renamed Rising Sun. Elvis adored Rising Sun, calling the barn at Graceland the Rising Sun Stables in his honor. 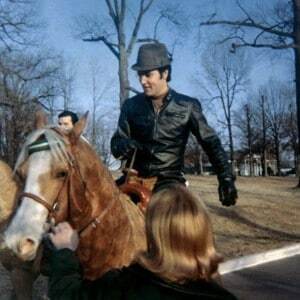 Elvis would often dress in a western outfit and ride his palomino at full speed in the front pasture at Graceland to the delight of his fans. Rising Sun died in 1986 and was buried at Graceland facing the east, in the direction of the rising sun. 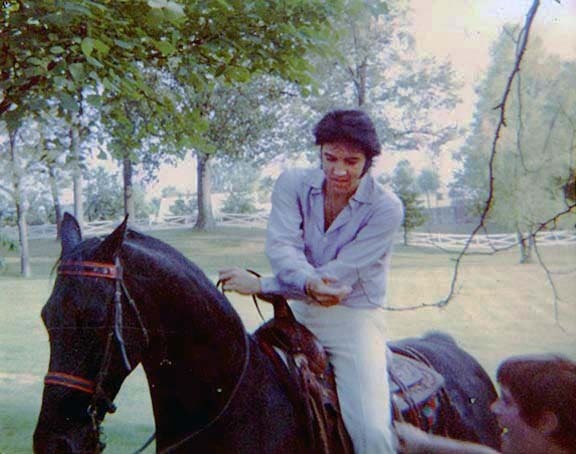 Elvis bought a black horse named Bear who is often called a Tennessee Walker, but there is evidence that he was a Saddlebred or a mixed breed gaited saddle horse. Elvis and Bear would go for rides in the fields around Circle G stables and sometimes perform a smooth gait for fans in the front pasture at Graceland. Several other horses resided at Graceland and Circle G, including Mare Ingram, a mixed breed mare who lived to be 50 years old, which Elvis named after the mayor of Memphis. 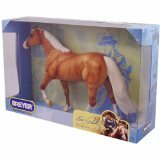 Lisa Marie Presley’s pony mare, Moriah, broke her leg but made a full recovery and lived to be 30. The last remaining horse Elvis purchased, Ebony’s Double, a Tennessee Walker gelding, died at 32 in 2005. Circle G Ranch and some of the horses were sold in 1974, with the remaining stock moved to Graceland. After Elvis’ death in 1977, the horses were neglected until stable manager Alene Alexander was hired in the early 1980s and went to work to bring them back to health. After Rising Sun died, Graceland’s managers established the tradition of always having a palomino on the grounds. 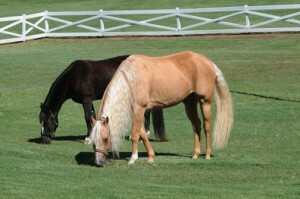 The resident palomino at Graceland, Tucker, with stablemate Candy. The Quarter Horse gelding Sun’s Reflection came to Graceland in 1988 and lived there until his death in 2009. A rescued palomino, Tucker, took Sun’s Reflection’s place later that year. Other rescued horses have come to Graceland to live: Max, a bay Standardbred gelding, and Bandit, a chestnut Quarter Horse gelding. Candy, a black Tennessee Walker gelding, was a gift. 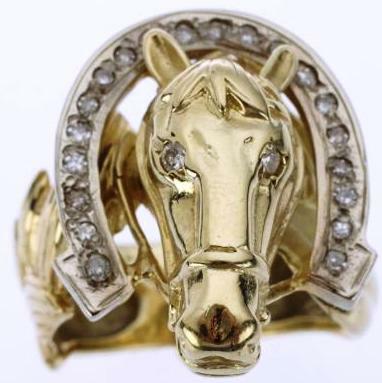 A 14 karat gold ring with 20 diamonds that Elvis commissioned to look like his personal mount, Rising Sun. The barn at Graceland was opened to the public for the first time in 2009, allowing fans a glimpse into one of Elvis’ favorite hobbies. Saddles, western clothing, and videos are on display on the tour. View photos of all the horses who have lived at Graceland. Below is a video with photos and footage of Elvis with his horses. but the horse looks at them as equals, right in the eye. Wow, I had no idea Elvis was such a horse lover. Nice collection of pictures you have here. You might have heard this already, but the white background on the photos makes them look like polaroids, which is a cool effect! Thanks, Keith! 🙂 This was a fun story to research and write. Thanks for your question, Teresa. An Elvis forum reports that Tucker is a registered Quarter Horse gelding.